Stem cells are the ultimate tools for banishing blood sugar concerns. Just a single stem cell boost eradicates blood sugar concerns — permanently. That’s because this cutting-edge technology targets the cellular cause behind blood sugar volatility — the cause that all solutions miss. You can now enjoy excellent blood sugar and insulin levels, completely safe and with no prescription. That’s the proven results stem cells are achieving! Yet until now, nobody has figured out how to crack our body’s code to generating all the stem cells we need. This is what makes RECOVERY: Metabolic Rescue such a landmark achievement. It uses ingredients that are shown scientifically to balance blood sugar in our own cells. It all adds up to hundreds in savings, including savings on dangerous solutions! 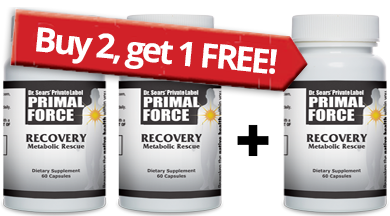 Plus, you never have to worry about quality or performance with Primal Force’s 100% Money-Back Guarantee. If you selected a VIP Auto Delivery option, your credit card will be automatically charged with each shipment. You'll never have to worry about reordering and you can cancel at any time!